As the parents were in the midst of trying to find the right path for Giselle Yeong, she chose her own path instead. 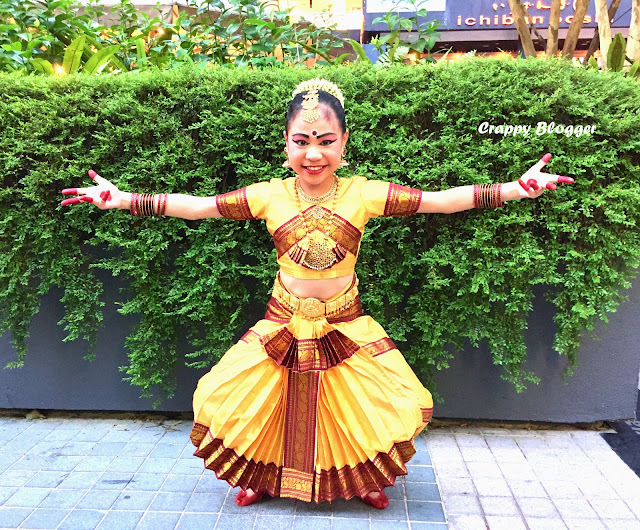 Despite the fact of being a Chinese Christian and having a very little encounter to Indian culture, Giselle Yeong still chose Bharatanatyam over ballet. While some kids are still figuring out on what they want, Giselle Yeong has already set her goals on what she wants since she was 8 years old. What inspired her? What made her claim this stage at this young age? Can every kid hold a hobby as a passion like her? Because this is the grandest dance. Usually, this dance will be performed at the temple. 2. Isn’t it Bharatanatyam is a tough dance? When I first started to dance, my teacher was very strict on me. She will keep asking me to stamp my feet harder and harder on the ground. I have gone home crying a few times too. Though I wanted to give up at first but my mummy kept motivating me not to give up. After that, I didn’t cry for long because the more I learn this dance, the more I love it so much. 3. What encourages and motivates you to dance when you’re tired? Every time I feel tired, I will think of my next performance, and that will encourage me and motivate me to practice harder. 4. Have you ever thought of giving up on dancing? Now, I don’t think of giving up. I really have lots of interest in this dance. 5. What do you think about Indian Culture? In some way, I think it is similar to Chinese. I don’t know. Maybe I am wrong. 6. What do you like about Indian Culture? I like to learn about different culture. I get to know about the different culture through food, celebration, and also different language. I can speak simple Tamil. 7. 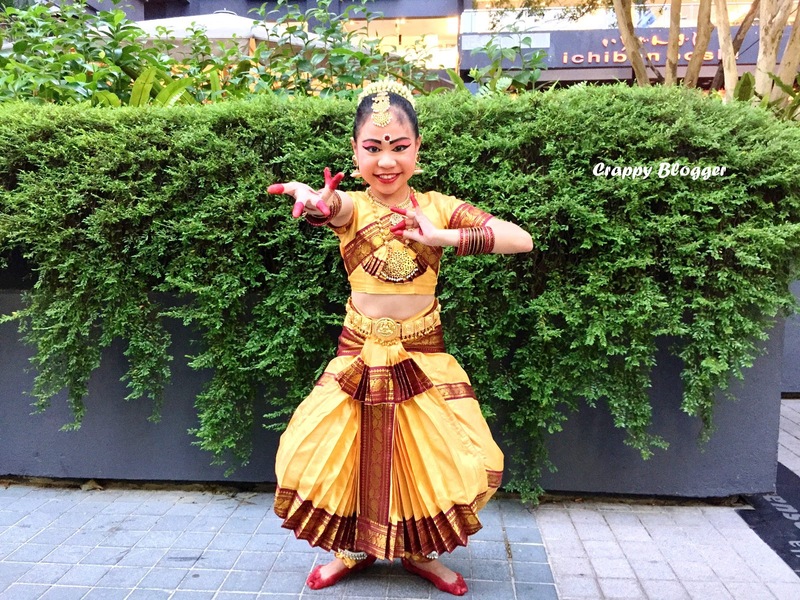 Other than Bharatanatyam, what else have you tried? When I was 3 years old my mummy sent me to ballet class. I find it not so interesting. And the when I was 7 years old, I start to watch youtube for K-Pop and learn by myself. I like it too until I saw a poster of Bharatanatyam, I immediately fell in love with the make-up, accessories, and costume. 8. What you think other kids around your age should do at their leisure time? I feel that I cannot concentrate on other things when I am on any type of electronic gadgets. I feel that it is a waste of time to play handphone games because I don’t get anything in the end. Also from young, my mummy have always encouraged me to do art and craft, reading, and go for outdoor activities. 9. Who has been encouraging your interest all this while and whom you would like to thank? Of course, I want to thank my mummy. I always share with her my thoughts and most of the time, she will support me to the fullest. Example, I want to keep a hamster but to my mummy, she is very scared of little pets. But just because she wanted to encourage me to be responsible for pets, she went and search so much of info for me on how to take care. I have the best-supporting mummy and I want to make her proud of me always. 10. What do you wish to do in future? I love to perform and I want to conquer more stages and hear many people clapping hard for me. I will continue to practice more to make people proud of me. 11. What would you like to tell to others? Always do the things that you like best and have the most interest and go for it and never give up. Do not let other people decide for you. I can choose what I want. As young as Giselle Yeong can be, it is clear that she is very matured by looking at the way she answered the questions. These days, most kids are better off to be left alone with their gadgets rather than forcing them to do something out of their comfort zone. Most of them don’t really take the effort to venture into something new if it doesn’t involve electronic stuff. Yet Giselle Yeong proved that with a proper guidance from family, leisure time can be used very productively and efficiently. What a child this is. Different, focused, and already know what she wants at this young age. I'm gonna look out for her name in the papers, soon! This is such a cool post. Giselle is amazing. Great interview.